3 STEPS TO A HAPPY HOLIDAY! 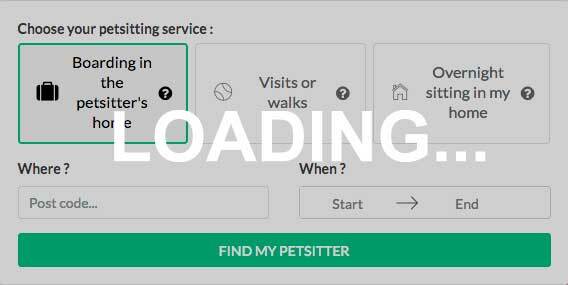 « Pet sitting » means that your pet is looked after either at a host family's home (boarding) or in your own home. It is a great alternative to kennels and catteries. In a host family, your pet will enjoy a caring environment for the whole time when you are away. Our sitters are real pet lovers and carefully vetted. We have more than 100,000 caring sitters in Europe and the UK so that we can find one near you. Do you have a dog that needs looking after while you are away? Whether small or large, we will find you a local caring sitter for your furry friend! Cats are independent and don’t necessarily need a permanent human presence. But if you need to be away for a long time, it is important to organise a suitable cat sitting service. Max & Kitty can find you a cat lover who will come and visit your cat in your home. Visits can last from 30 to 45 mins. More importantly, they can be adapted to your specific needs. You may have small pets instead that you can’t take with you when you go on holiday. Not a problem. Max & Kitty can find you an ideal sitter for your small pet sitting. We accept most small pets including ferrets, birds, hamsters, guinea pigs, rabbits, parrots.